Progression of symptoms and objective findings on repeated examination at hourly intervals confirm the diagnosis of compartment syndrome. Particularly important findings are continued severe pain that is unresponsive to usual analgesics, increased paraesthesia and hypaesthesia, and increased pain on attempted passive stretch testing of the involved muscles. A model to explain the development of compartment syndrome premises that ischemia begins when local blood flow cannot meet the metabolic demands of the tissue. The rise in intracompartmental pressure is due to oedema or haemorrhage from soft tissue injury or fracture. As volume increases, venous return becomes hindered but large arterial vessel flow is relatively unaffected. As the intracompartmental pressure rises, the intraluminal venous pressures also increases leading to a reduction in the arteriovenous pressure gradient with subsequent diminished or absent local perfusion. The resulting reduction in venous drainage causes a further rise in interstitial tissue pressure with the formation of tissue oedema. It is only in the late stages of a compartment syndrome that the arterial flow into the compartment is seriously compromised. The continuing flow of blood into the compartment augments the swelling and oedema throughout the early stages of the syndrome. Both the magnitude and the duration of increased tissue pressure adversely affect the perfusion of the compartment. As normal perfusion pressure of capillaries is in a range of 30-35 mmHg, the critical compartment pressure seems to be 30 mm Hg or higher, for duration of six hours or longer. There is still no conclusive answer as to the critical threshold of intracompartmental pressure at which fasciotomy should be performed. The comparison of diastolic blood pressure and compartment pressure is a relative indicator of tissue perfusion. If there is a fracture, compartment pressure measurements should be taken as close to the fracture site as possible and in multiple locations. Compartment measurements within 30 mmHg of diastolic pressure are commonly seen as an indication for fasciotomy. Since the pressure is not a direct measure of tissue damage and there is considerable variation among individuals as to their tolerance to a given pressure, it may not be possible to define the critical level more satisfactorily nor to establish the duration of raised intracompartmental pressure which results in an acute syndrome. According to Tscherne3, the more severe the initial soft-tissue injury, the greater the probability is that soft-tissue complications, including compartment syndrome, will develop. Monitoring of the intracompartmental pressure should be routine, in patients in whom subjective clinical assessment is not available, i.e. in unconscious or uncooperative patients, and in those under the age of 35 years with injuries to the lower leg4. Close observation is required until the acute swelling begins to subside. 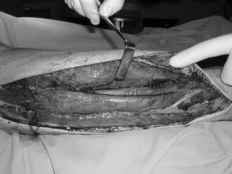 Primary therapy of the compartment syndrome is fasciotomy. Fasciotomies must be extensive enough to completely relieve the constrained internal pressure, and therefore must extend into normal tissues proximally. In III° degree burns, escharotomy alone is usually insufficient and fasciotomy also must be performed. Physiologic skin incisions are performed with care to avoid damage to deeper structures (ulnar nerve at the elbow, median and ulnar nerves at the wrist, digital nerves in the fingers) and to prevent unnecessary secondary scar contractures. The well known effects of HBO generate a favourable gradient from functioning capillaries to compromised cells with an increment in oxygen supply. This may allow compromised tissue to survive. Inhibition of oedema is the second fundamental effect of HBO in early adjunctive treatment of compartment syndrome.